Home » A Female Kabardian of Mount Caucasus. Une Kabardienne du Mont Caucase. 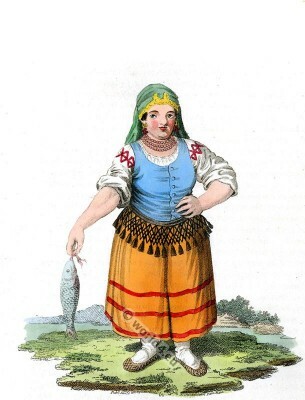 THE dress of all the Tartars of Mount Caucasus (Kabardin, Circassian, Cherkessia) is nearly the same, and chiefly consists of the long garment of the Orientals. The Tartars of Kabarda are particularly distinguished by the richness and majestic elegance of their apparel. They wear the finest linen, loose drawers, and short morocco boots embroidered. Over their tunic, which is fastened with a long silk girdle, is thrown a large robe of fine cloth or silk, the sleeves of which hang down be-hind. To their girdle is fastened a poniard, and their cimeter is hung with silver chains to their side. They shave the head, which is covered with a cap of gold or silver, ornamented with rich embroidery, and partly concealed by a bonnet widening towards the top. The poorer sort make their clothes either of cotton, or of a coarse cloth which they manufacture themselves. The females of Kabarda dress, in every respect, like the Armenians. The tartars of Mount Caucasus live better than any of the other tribes. They eat at table, seated upon chairs. Strict observers of the laws of Mahomet in every other respect, they are, unfortunately, but too much addicted to strong liquors. They drink wine, brandy, hydromel and a sort of strong beer, which they brew themselves, similar to that made in England. So great is the preference of the Kabardian to his first wife, that the situation of the others is rendered very uncomfortable. Their wives are, therefore, seldom numerous; but what they want in this respect, is made up in the number of their concubines. They pride themselves too much upon their generosity, to acknowledge that they purchase their wives; they only confess that they make a present to their father-in-law: they dispute, however, with as much warmth about the precise value of this present, as any of the other eastern nations. All of them follow the religion of’ Mahomet: those to the north of Cauca-sus are disciples of Omar, while those to the south arc of the sect of Ali. They are not provided with priests and places of worship in every district; and in no part have they yet established schools for the education of their children. They follow the faith of Mahomet without understanding its dogmas, and frequently confound its ceremonies with those of Christianity and Schamanism. Like the Mahometans, Friday is their Sabbath, and, like the Christians, Sun-day is with them a day of rest. They bury their dead according to the Mahometan ritual; and often, as if they were Christians, they erect crosses over their tombs. This entry was posted in 1803, 19th Century, Asia, Caucasia and tagged Edward Harding, Russian national costumes on 11/2/14 by world4.